Businesses everywhere are discovering the merits of tablet computing but require a business-oriented device that empowers their mobile workforce to get real work done. 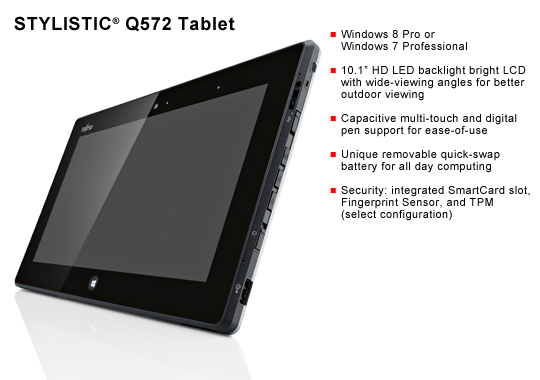 The STYLISTIC Q572 is the culmination of 20 years of Fujitsu tablet PC engineering expertise. Microsoft® Office Starter 2010 (32 bit) includes reduced-functionality versions of Word® and Excel® only, with advertising. No PowerPoint® or Outlook®. Purchase Microsoft® Office 2010 to activate a full-featured suite.